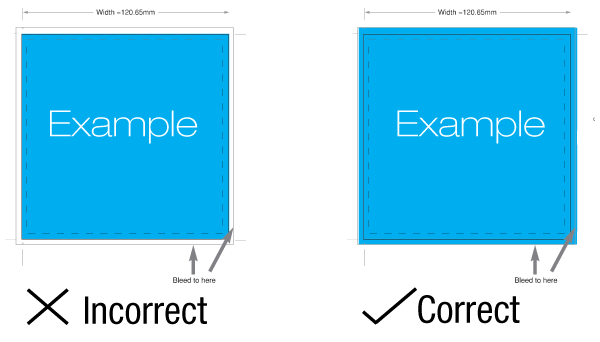 This is a quick guide to how to set up your artwork within the templates we provide. 1. Make sure you are using software with a file type we support, such as Adobe Photoshop, Illustrator or InDesign. 2. Open your document and Place or Paste the template on its own layer. Ensure it is at the correct size and has not been resized automatically when placing the file (especially if you are using InDesign). Our templates include the actual dimensions the artwork should be. 3. Ensure your artwork is in its own layer below the template, so that the template guides (solid and dashed lines) are visible. Position and then Lock the template layer, so that it does not shift. Safety or Type Safety Line – This is the innermost line, showing where important content must fit to ensure it is not trimmed off or too close to the edge of the page. Bleed – This is usually a dashed or solid line beyond the cut line. If your artwork extends to the edges of the page, you must add an additional 0.125″-0.25″ area of bleed. This is to account for minor differences in print area. Bleed ensures that your artwork prints right up to the edges of the paper as intended, without an unsightly white border or hairline. Do not extend text or important images into the bleed – much of it will likely be trimmed off. Crop marks – These two small lines in each corner are positioned to show where the document will be trimmed. Pagination – Booklets and folded inserts require pages are set in a specific order for printing, referred to a Printer’s Spreads. Please see ‘How to Prepare your Booklet File’ for more on this topic. 5. 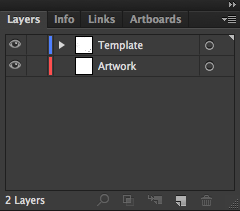 After you are certain your artwork fits the template guides, turn off the visibility of your template layer. 6. Save your artwork either in its original format (.PSD, .INDD, .AI) or as a PDF with Layers/editing capabilities preserved. Make sure you also package all fonts, linked images, etc. Do not flatten the template layer on top of your artwork, as we will then not be able to remove it for printing.